The Reverend Osagyefo Uhuru Sekou is an organiser, author, film maker, pastor and member of the Fellowship of Reconciliation — the oldest interfaith peace organisation in the US. A graduate of Soldan High School in St Louis, Missouri, Sekou has deep ties to the region around Ferguson. He experienced racism and violation by police when growing up there, and has written about his experiences. 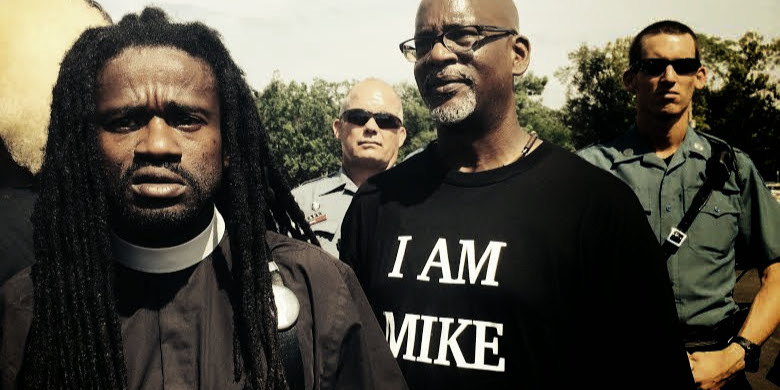 Sekou has spent the past three months in Ferguson participating in the protests to demand justice for Michael Brown. He has helped train over 800 activists in nonviolent civil disobedience techniques, and has been arrested twice for acts of civil disobedience on protests. Rev Sekou is currently scholar in residence at Stanford University’s King Institute. His record of protesting against police racism ranges from organising protests over the police beating of Rodney King to visiting Britain in the wake of Mark Duggan’s death at police hands. He is active on wide range of related social justice issues, including Palestinian rights, climate change, homophobia and sexism. Black lives matter. Black lives should have mattered before they were gunned down or choked to death, both to the officers charged with protecting and serving them and to a judicial system that has exposed itself as involved in a deadly chokehold of its own. I went to high school here. I remember being told by my mother and my sister not to go through Ferguson. I remember police sticking their hands in our underwear, accusing us of being drug dealers. And the rage that we have seen today is a reflection of the alienation that young people feel. We are called to be protesters — at once outraged and disciplined. By placing our bodies on the cross of a militarized police, deep infrastructural racial bias and a system that profits from human misery, a new way of being and seeing America and all its promise is being born. Riots initiated by people of colour in Western societies are typified by three factors: young alienated ethnic community, a history of police brutality, and a biased criminal justice system in which othered bodies do not receive fair treatment. Riots are a response to the unrequited ideals of their nation.